You will earn 5,636 Reward Points. Earn 1 reward point for every 1 dollar spent. Walk-In Cooler, Outdoor Polar-Pak, 7'-6.25" H, 5'-10" W, 5'-10" L, floorless, 3/4 hp. medium temp (+38F) top mounted unit, 26 ga. embossed galvalume interior & exterior, 4" metal screeds with base cove, 2" dial thermometer, supplied with roof cap & accessories for flashed or free-standing applications ***Outdoor Polar Pak systems will not be available for areas where winds exceed 110 mph and/or the snow loads are above 20 psf. 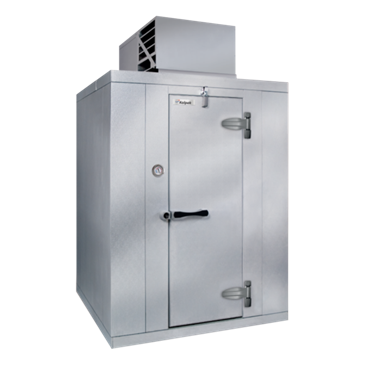 The Kolpak PX7-066-CT-OA Walk-In Cooler is a floorless, outdoor cooler that uses a 3/4 horsepower, medium-temperature, top-mounted compressor to keep your inventory chilled and fresh. It features a 26 gauge embossed galvalume interior & exterior for maximum durability, and a 2" dial thermometer for quality temperature control. This cooler is 90 inches tall, 70 inches wide, and 70 inches deep. It is not for use in areas where winds exceed 110 mph and/or the snow loads are above 20 psf.